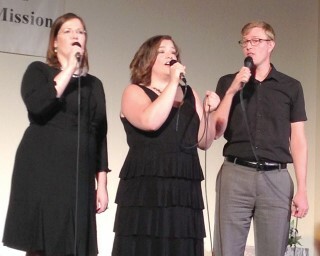 On Saturday, July 29, an annual tradition once again delighted an almost full house at the North Windham Union Church, as the talented Broadway and Beyond ensemble took to the stage for a lively evening of laughter, fun and great music. This concert never disappoints. Accompanied by Dr. Laura Artesani on piano, this year’s performance featured Matthew Small, Emily Cain and Kelly Caufield. With music that ranged from show tunes and old standards to the Indigo Girls and a pop song, the balance was just right. Each performer had their own style, and the three melded together to create engaging entertainment that the audience wished didn’t have to end. The concert began with the trio making a high energy entrance while singing “Seize the Day.” From there, they began a rotation through solos, with occasional duets interspersed throughout. Both acts began with the three together and they joined again for the final song and encore. It was a nice balance, and I could have listened to all three of them perform together all evening; their voices blended in lovely harmony, and it was clear to see how much they enjoy sharing a stage. One of the things endearing about this concert each year is that there is no “star” of the show. It’s a true group effort. Even though Cain hadn’t participated in the show in several years, it was clear they have all spent considerable time performing together in the past. The ensemble comes together for Broadway and Beyond with little rehearsal time and puts on an amazing show year after year. The whole show felt like hanging out with friends who just happen to be performing. The banter and personal stories drew the audience in, creating a feeling of connection and camaraderie. The songs they selected offered a nice range: silly, serious, moving and just plain fun. Each song was quite different, but the flow from one to another, bridged with the stories the performers shared, was smooth. Small and Caufield have been performing together since they were in the 8th grade, and were in the show “Narnia, The Musical” at the Schoolhouse Arts Center. Their long history sometimes presents a problem, they said, in that it’s difficult to perform a duet without wanting to burst into laughter. After the three sang the last song, a powerful ballad called “One Voice” by the Wailin’ Jennys that earned them a standing ovation, they asked if the audience wanted one more. Met with enthusiastic applause, they broke into a silly routine where each began a different song, but finally landed on “Goodnight Sweetheart.” It was a fitting song to end the evening, and the audience even sang along. The concert was the 46th in the Music with a Mission concert series, which has raised nearly $50,000 to support the church and other community organizations since its inception. Part of the proceeds from the Broadway and Beyond concert went to support Special Olympics Maine. For more information or to find out about upcoming shows, visit www.mwamconcerts.com. It's wonderful that your publication continues to cover the local arts scene. Thank you!